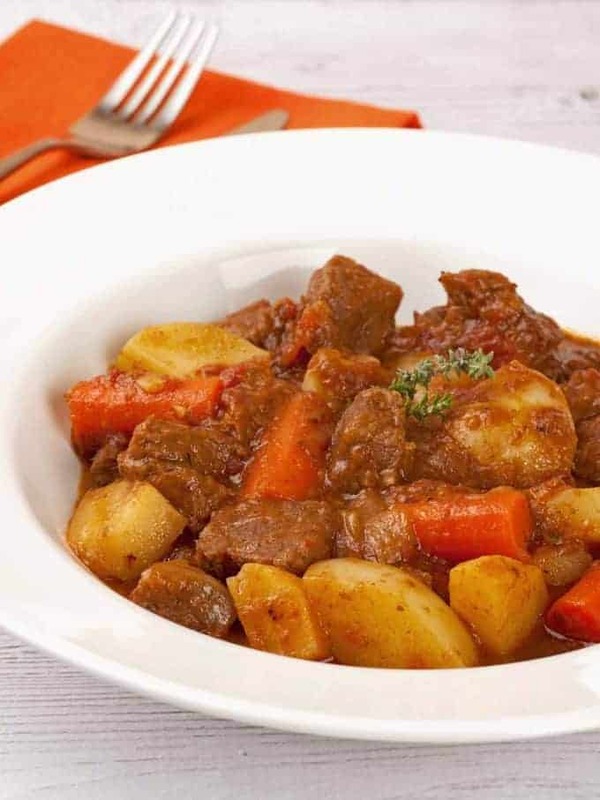 A pressure cooker is an ideal way to prepare beef stew, not just because it’s speedy, but because it retains all the natural moisture of the meat and vegetables so well. This is our favorite beef stew recipe – simple, but tremendously flavorful. 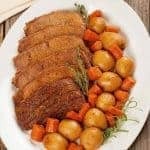 As an alternative to stew beef, try our recipe for Pressure Cooker Pot Roast which is made with a rump roast. 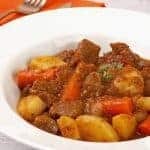 This is our favorite beef stew recipe – a simple combination of ingredients cooked to flavorful perfection in a pressure cooker. Combine the flour, salt and pepper in a shallow dish, dredge the beef, shake off the excess flour and set aside. Combine the beef broth, Worcestershire and mustard in a measuring cup and set aside. Heat the olive oil in the pressure cooker over medium-high heat. Add the beef and cook, turning frequently, until lightly browned on all sides. Transfer the beef to a plate and discard any excess fat. Reduce the heat to medium and add the olive oil to the cooker. Add the onion and cook until soft and translucent, about 4 to 5 minutes. Add the garlic and cook 1 minute longer. Stir in the beef broth mixture and tomatoes, scraping up any browned bits from the bottom of the pan. Return the beef to the cooker and bring the mixture to a simmer, raising the heat if necessary. Cover the cooker, lock the lid into place and bring it to high pressure. Cook for 20 minutes at high pressure, then remove from the heat, release the pressure, taste the gravy and adjust the seasoning as needed. Add the potatoes, carrots, turnip and thyme leaves. Cover the cooker and lock the lid in place. Bring the cooker back to high pressure, then cook the stew for an additional 5 minutes. Remove the cooker from the heat and allow the pressure to drop naturally before opening. Spoon the stew into bowls and serve immediately. 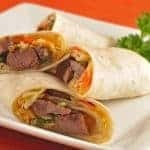 Great recipe – I followed it carefully it .and turned out very well. Pressure cooking sure saves a lot o time. Will make again soon!! A pressure cooker is a great addition to any kitchen. It makes it so easy to make a dish like this in a fraction of the time. 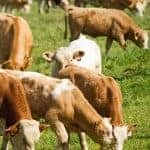 What changes should I make if the beef is frozen? Skip flouring the beef and just put it in the pot with a bit of oil and try to get a little browning on the outside. You may be able to break it up a bit too. Once that’s done, remove it from the pot, sauté the onion and garlic as directed and follow the rest of the recipe with one exception: Add 5 minutes cooking time to the beef (25 minutes instead of 20). I made this tonight and it is excellent. I did use parsnips for the turnip. I am new to using a pressure cooker and have to adjust recipes for mine (faberware) which did not come with very good instructions. Anyway, this was very good I only had to cook the vegetables longer. Thank you for this delicious recipe and anyone looking for a pressure cooker do not buy faberware, the manual is terrible and the little bit that you can download from this isn’t very helpful. 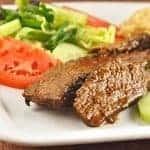 I am new to using a pressure cooker. I made this today and it’s superb. I too, had to make changes and use what I had on hand and added quartered mushrooms and a bag of frozen peas with carrots and potatoes, but followed all the other directions as noted. My goodness, is it ever good! Thanks for sharing this excellent recipe! I have made this twice now. Just love this Stew. I did make some changes, I replaced the Turnips with celery, ( I hate Turnips). Also after it was all done I added about 2 tlb. of Kitchen Bouquet. So glad you like the recipe and the instructions work out well for you. Thanks for taking the time to let us know. I was going to say in my review for for got that I used an Wolfgangpuck 8-Quart Rapid / Pressure Cooker. I’ve been wanting to make Beef Stew in a Pressure cooker for years. I bought some stew meat that was in the markdown section at the grocery store and needed to cook it or freeze it fast. I found this recipe on line and decided to give it a try. I had most of the ingredients on hand and only needed to pick up the Turnip and fresh Thyme. The Stew was seriously amazing!! I only made a few slight changes to the original recipe. I cooked the meat on high for only 15 minutes, not 20 because I browned the meat a little too long. I used 6 medium potatoes and 6 large carrots. I also was generous with the Thyme, This was exactly the kind of stew I’ve been dreaming of and I can’t wait to try some of your other recipes! So glad the stew turned out the way you wanted. The pressure cooker is such a great appliance – fork-tender meat in no time!